A smart city is a municipality that uses information and communication technologies to increase operational efficiency, share information with the public and improve both the quality of government services and citizen welfare. Telecommunication infrastructure is the cornerstone of all Smart Cities i.e. data centers, fiber optics and wireless networks. 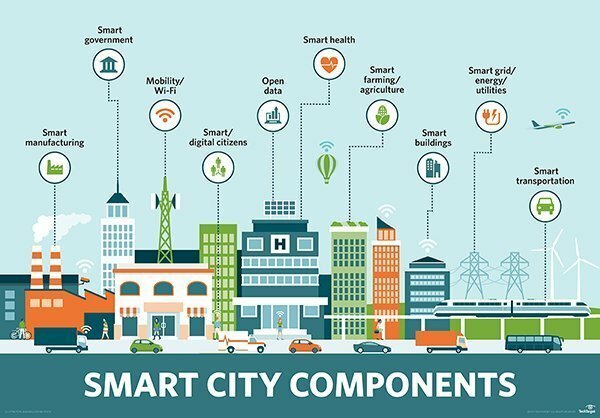 While the exact definition varies depending on whom you talk to, the overarching mission of a smart city is to optimize city functions and drive economic growth while improving quality of life for its citizens using smart technology and data analysis. Emerging trends such as automation, machine learning and the internet of things (IoT) are driving smart city adoption. Theoretically, any area of city management can be incorporated into a smart city initiative. A classic example is the smart parking meter that uses an app to help drivers find available parking spaces without prolonged circling of crowded city blocks. The smart meter also enables digital payment, so there’s no risk of coming up short of coins for the meter. Also in the transportation arena, smart traffic management is used to monitor and analyze traffic flows to optimize streetlights to prevent roadways from becoming too congested based on time of day or rush-hour schedules. Smart public transit is another facet of smart cities, used to ensure public transportation meets user demand. Smart transit companies are able to coordinate services and fulfill riders’ needs in real time, improving efficiency and rider satisfaction. Ride-sharing and bike-sharing are also common services in a smart city. Energy conservation and efficiency are major focuses of smart cities. Using smart sensors, smart streetlights dim when there aren’t cars or pedestrians on the roadways. Smart grid technology can be used to improve operations, maintenance and planning, and to supply power on demand and monitor energy outages. Smart city initiatives also aim to monitor and address environmental concerns such as climate change and air pollution. Sanitation can also be improved with smart technology, be it using internet-connected trash cans and IoT-enabled fleet management systems for waste collection and removal, or using sensors to measure water parameters and guarantee the quality of drinking water at the front end of the system, with proper wastewater removal and drainage at the back end. Smart city technology is increasingly being used to improve public safety, from monitoring areas of high crime to improving emergency preparedness with sensors. For example, smart sensors can be critical components of an early warning system before droughts, floods, landslides or hurricanes. Smart buildings are also often part of a smart city project. Legacy infrastructure can be retrofitted and new buildings constructed with sensors to not only provide real-time space management and ensure public safety, but also to monitor the structural health of buildings. Attaching sensors to buildings and other structures can detect wear and tear and notify officials when repairs are needed. Citizens can help in this matter, notifying officials through a smart city app when repairs are needed in buildings and public infrastructure, such as potholes. Sensors can also be used to detect leaks in water mains and other pipe systems, helping reduce costs and improve efficiency of public workers. Smart city technologies also bring efficiencies to urban manufacturing and urban farming, including job creation, energy efficiency, space management and fresher goods for consumers. Sustainability is another major facet of smart cities. Urbanization is expected to increase even more in the coming years — today, 80% of the U.S. population lives in metropolitan areas versus 60% just 50 years ago. Smart technology will help cities sustain growth and improve efficiency for citizen welfare and government efficiency in urban areas in the years to come. Water meters and manhole covers are just a couple of the other city components monitored by smart sensors. Free and/or publically available Wi-Fi is another perk smart cities often include. Smart city initiatives must include the people it aims to help: its residents, businesspeople and visitors. City leaders must not only raise awareness of the benefits of the smart city technologies being implemented, but also promote the use of open, democratized data to its citizens. If people know what they are participating in and the benefits it can bring, they are more likely to engage. Fostering collaboration between the public and private sector and city residents is key to creating a smart citizen who will be engaged and empowered and positively contribute to the city and community. New and innovative collaboration methods can improve engagement. Smart city projects should include plans to make the data transparent and available to citizens, often through an open data portal or mobile app. This enables residents to engage with the data and understand what it is used for. Through a smart city app, residents may also be able to complete personal chores, such as viewing their home’s energy consumption, paying bills and finding efficient public transportation. Smart city opponents worry that city managers will not keep data privacy and securitytop of mind, fearing the exposure of the data that citizens produce on a daily basis to the risk of hacking or misuse. Additionally, the presence of sensors and cameras may be perceived as an invasion of privacy or government surveillance. To address this, smart city data collected should be anonymized and not be personally identifiable information. San Diego installed 3,200 smart sensors in early 2017 to optimize traffic and parking and enhance public safety, environmental awareness and overall livability for its residents. Solar-to-electric charging stations are available to empower electric vehicle use, and connected cameras help monitor traffic and pinpoint crime. Often considered the gold standard of smart cities, the city-state of Singapore uses sensors and IoT-enabled cameras to monitor the cleanliness of public spaces, crowd density and the movement of locally registered vehicles. Its smart technologies help companies and residents monitor energy use, waste production and water use in real time. Singapore is also testing autonomous vehicles, including full-size robotic buses, as well as an elderly monitoring system to ensure the health and well-being of its senior citizens. Making sure the U.S. has super-fast, high-capacity, ubiquitous broadband networks delivering speeds measured in gigabits, not megabits isn’t just a matter of consumer convenience, as important as that is. It’s essential to economic growth, job creation and U.S. competitiveness. In our 21st century economy, innovation leadership is necessary for economic leadership. Our broadband infrastructure is our central platform for innovation, and faster speeds will spur innovation. In a global economy, talent and capital can flow anywhere, and they’ll flow to countries with the strongest innovation infrastructure. We’re in a global bandwidth race, and we need to ensure the U.S. has a strategic bandwidth advantage. Without it, we risk losing our global lead on innovation, and we risk watching jobs and investment flow elsewhere. The good news is that there’s lots of good news. After falling behind Asia and Europe, we’ve regained global leadership in mobile. The U.S. is the first country to deploy 4G wireless networks at scale and is home to most of the world’s LTE subscribers, making the United States the global test bed for LTE apps and services. The mobile “apps economy,” which has already created hundreds of thousands of jobs, is a made-in-the-USA phenomenon. On the wired side, broadband networks capable of 100 megabits per second speeds passed less that 20% of U.S. homes in 2009. That number is now more than 80%, which is near the world lead. By contrast, in Europe, networks capable of 30 megabits per second reach only 50% of households. But progress isn’t victory, particularly in this fast-moving sector. To maintain U.S. leadership in innovation, we need to keep pushing for faster broadband networks, and we need a critical mass of innovation hubs that offer homes and businesses access to gigabit broadband. This would bring supercomputing power to Internet users and would drive inventions we can only barely anticipate. We’ve already begun to see the promise of gigabit connectivity to drive innovation and investment in a handful of forward-looking U.S. communities. Chattanooga, Tennessee built out a gigabit fiber network that has helped attract businesses like Amazon and Volkswagen, creating more than 3,700 local jobs. We see similar stories in communities as diverse as Cleveland and Lafayette, Louisiana. Seeing this success, the mayors of Chicago, New York and Seattle have all come forward with plans to launch gigabit testbeds in their cities. And the Gig.U initiative has already catalyzed over $200 million in private investment to build ultra-high-speed hubs in the communities of many leading research universities. We need more of these gigabit testbeds to ensure there is a sufficient market in the U.S. for super-high-bandwidth applications and services. A critical mass of gigabit communities will spur innovation and investment. But this seriously misreads what the U.S. needs to grow our economy and maintain our leadership in today’s global, innovation-driven economy. And it also overlooks the history of U.S. innovators to take advantage of increased network capacity. Gigabit networks can enable genetic sequencing to treat cancer patients, immersive and creative software to support lifelong learning from home, and ways for small businesses to take advantage of Big Data. Greater network speeds will certainly lead to unexpected new inventions. That’s been consistently true since the Internet began. We need U.S. innovators to develop tomorrow’s technologies here, and gigabit testbeds will help ensure that the U.S. remains a magnet for the world’s greatest entrepreneurs. Make no mistake, if the U.S. doesn’t continue to invest in our broadband infrastructure, somebody else will take the lead. America led the 20th century economy because we led the world in innovation. Leadership in innovation is even more important in today’s global economy. Ensuring the U.S. has a strategic bandwidth advantage – ultra-fast, high-capacity, ubiquitous broadband – is critical to our global competitiveness. Our history provides a clear lesson about infrastructure: If we build it, innovation will come.